Johann Stein was born in 1810 in Hesse Darmstadt Germany, Heinrich Stein and his wife Catharine Schram were his parents. Both his father and grandfather were respected shepherds. Johann emigrated in the 1840's, having done his military service in Germany. He sailed on the Edwina, arriving in New York (or Boston according to some accounts) in 1841. He came to Wilmot Township, Waterloo County, where other Hessians had settled. 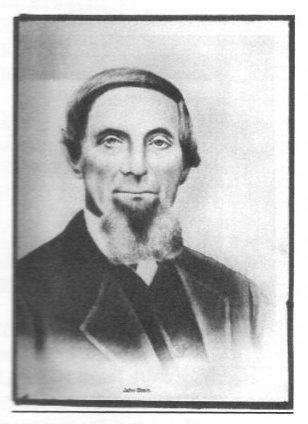 In 1843, he married Elizabeth Bender in the town of Greenbush, which has vanished now, it is part of the City of Kitchener. He had five brothers and sisters whom he later helped emigrate, and one brother who stayed in Germany..
From the time he arrived in Canada, Johann referred to himself as John, as shall we from here on. John was a cooper, or a barrel-maker, and he and Elizabeth settled first at Fishers Mill near Hespeler. Eight children were born there, one did not survive infanthood. The boys learned their father's trade, and the girls learned household duties. The other girls married and moved away and household responsibility fell on the youngest daughter Rosina because Elizabeth was often away midwifing. Granddaughter Regina Mast wrote "Grandmother Stein was often called to nurse the sick and the local doctor would instruct her. She was often away nursing the sick instead of staying at home." John was a true craftsman and made sure his work was rewarded. In 1853 he took one of his customers to court in a dispute over the number and price of flour barrels he had sold him, and was awarded 9 Pounds after arguing for six hours - well into the evening - before the Judge. John and Elizabeth moved to Morriston about 1850, as the opportunities for barrel making petered out in Fishers Mills. In 1854, they bought the property at Lot 6 from John Calfass and lived the rest of their lives in the log house still standing there and now restored on Brock Street. We aren't sure who built this house, but it may have been John Calfass himself. John Stein ran his cooperage from the basement at the back of the house where the land falls away. It opened out onto his garden where he also cultivated fruit trees and a garden. Eventually daughter Rosina married William George Mast of Puslinch and they farmed in Puslinch. The Masts descendants are still around. The rest of John and Elizabeth's children scattered to USA and other parts of Ontario. By 1851, Elizabeth's father Henry, a shoemaker, was a widower and living with them. William Bernhart, a cooper who worked for Johann, was also part of the household. Ten years later in 1861, the father Henry was 84 years old, still living with the Steins, but by 1881 the household was reduced to John, Elizabeth, and grandson John Kellerman, age seven, who later married Elizabeth Aiken of Aikensville, on Road #34. John helped to bring several of his brothers and his mother from Germany. His sister Caroline also came to Morriston and married William Bernhardt, the cooper employed by John. When he died, she married Eckhardt Hohberger, a weaver. He and Caroline lived on Lot 27 of the Ochs Survey in Morriston. The Steins and the Rappolts were connected in Germany before any of them emigrated. Elizabeth's sister Catharine Margaret was married in Germany to Louis Rappolt, and after he died about 1868, she emigrated to Morriston with her sons to be near Elizabeth. John's granddaughter, Regina Mast wrote the following about him. He…"had served the compulsory two years in the German Army, most likely as one of the Duke of Hesse's conscripts whom he hired out to foreign powers for so many marks a head. Grandfather Stein did not see any military conflict, only the most rigorous military discipline and training…" He immigrated to Canada in 1840 at the age of thirty years. They came by stagecoach to Upper Canada by way of Buffalo, Niagara Falls, to Hamilton, then to Morriston." "Darmstadt, 15 miles south of Frankfurt in southern Germany, lies protected from the cold eastern winds. It is in this fruit belt that cherry, apple and pear orchards blossom a month earlier than elsewhere in Germany and where even figs, apricots and almonds will grow. John sent home for fruit pits and planted them in his Morriston garden which grew and produced fruit trees. In fact, in the 1891 census taken three years before he died, John gave his occupation as "gardener". In 1893 the Steins celebrated 50 years of marriage, the first Golden Wedding of Morriston and were feted by many friends from the German Evangelical Church. The following year, John had a bad fall and never recovered. He died in 1894 at the age of 84. Elizabeth too, was subject to several falls, but lived on a few more years. She and her daughter Mary moved to Victoria Street in Morriston, switching houses with George Finkbeiner. She died in 1903 at 83 and Mary sold the Stein log house to the Finkbeiners.